Description Air temperatures are warm and Puget Sound continues to show record high water temperatures. Some rain has returned to our region, yet river flows remain unusually low. Puget Sound is saltier than normal allowing oxygen-rich surface waters to more easily mix to greater depths. Lower oxygen was measured only in the Coastal Bays, Hood Canal, and South Sound. 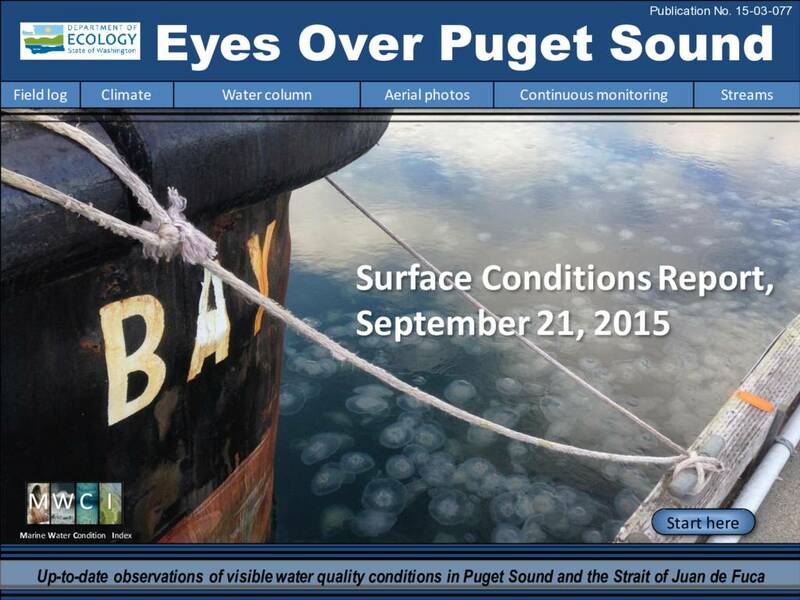 Large jellyfish aggregations continue in South Sound, the Kitsap Peninsula, and East Sound (Orcas Island). Sediment plumes in Bellingham Bay form unique patterns. Warm waters and sunny conditions fostered green tides, raising a stink along some local beaches.